30-year-old Chet Gebert was one of the Fargo Forum’s staff photographers. 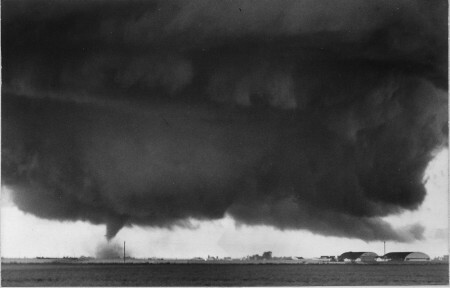 Just after 7:30pm on June 20th, 1957, heavy storms rolled into the Valley, and while out on his beat Chet pulled in just north of the Star-Lite Drive-In and pointed his camera to the southwest. There wasn’t any Fargodome at that time, no RedHawks stadium, it was fields and empty land as far as you could see…until Golden Ridge, that is. Golden Ridge had a bad reputation: even when my daughter was in gradeschool, so we’re talking 21st century here, Golden Ridge was seen as a crime-ridden, low-rent, wrong-side-of-the-tracks part of town. It was sandwiched between the Great Northern railroad yards and the old industrial part of downtown Fargo, so back in the early life of Golden Ridge the reputation might have been true, but by the time I was a kid it was a regular North Fargo neighborhood. If you drive west on 7th Avenue north, you reach the intersection of 7th avenue and 25th street — the corner with the abandoned gas station marks the southeast corner of Golden Ridge. I guess the abandoned gas station doesn’t really improve the area’s image much. But, you can easily drive a large square around Golden Ridge: the division between industrial buildings and residential homes is a stark line delineating Golden Ridge. The ‘point’ at the bottom is where the vacant gas station sits today. The Fargo tornado — the third of four spawned by this storm — first touched down further west, about the spot in Gebert’s photos, around where the Fargo Landfill is today. Golden Ridge was its first contact with civilization and it strolled right down 8th Avenue North. Most deaths were along here: first it hit the Tigen house at 718 29th street, just south of the Golden Ridge School, killing Don Tigen and injuring his wife. The tornado killed the entire Udahl family at 802 27th St., and a block east it killed six children at the Munson home, 818 25th Street (marked on the photo above). 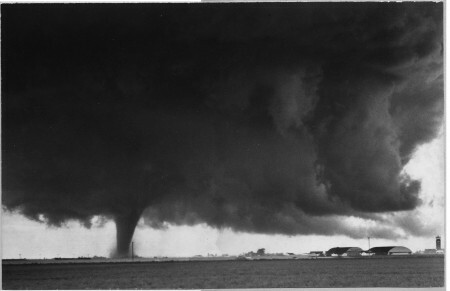 The second photo above is the iconic image that gets used whenever the Fargo tornado is discussed; all three appear in the 6/22/57 Fargo Forum that I’ve got a copy of. The printed-reproduced-dithered-halftoned-and-photocopied-again image doesn’t do justice to the photos themselves. The clouds aren’t a single mass of black: the thunderhead is a writhing mass of wind and rain. 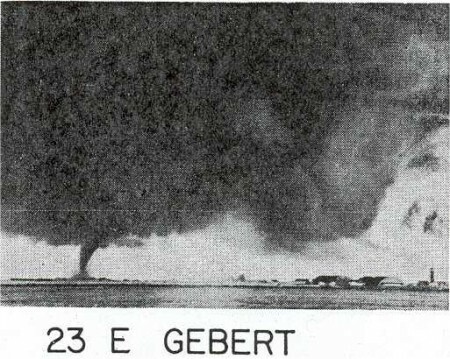 Incidentally, the photo at the top is called “23 E GEBERT” because, in the Weather Bureau report on the tornado, it happens to be the 5th photo from Chet Gebert, and taken at location #23 on the list. The report says over 200 photos were taken of the tornado, and amusingly notes that they got a number of pre-tornado photos of the stormcloud because people, upon hearing the tornado warning, went outside and began taking pictures of the quickly-rotating wall cloud, thinking it was the tornado itself. The Weather Service report credits both movie segments to a 16mm film made by a “Jennings” — that would be WDAY’s Harry Jennings from the “top of the WDAY Building” at 205 N 5th street, now the offices of Prairie Public. All of these pictures and films, particularly the unintentional pre-tornado photos, are the reason the Fargo tornado has had a lasting impact on storm analysis. Tetsuya “Ted ” Fujita wrote “Research Paper No. 42″ for the Weather Service, a photo-filled analysis on the Fargo tornado that helped spawn the Fujita Tornado Damage Scale and codified many of the terms used in describing tornadoes today. 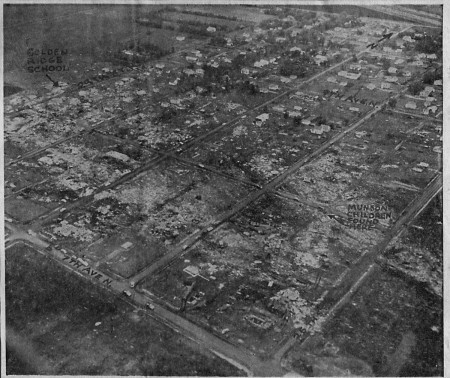 The 1957 Fargo tornado was at its most powerful when it struck Golden Ridge, but it still continued on through North Fargo. It hopped the Great Northern tracks just southwest of the soccer fields and NDSU’s “T Lot”. NDSU was saved due to a slow right turn, which mangled several blocks of residential housing and hit the old Shanley High School building. 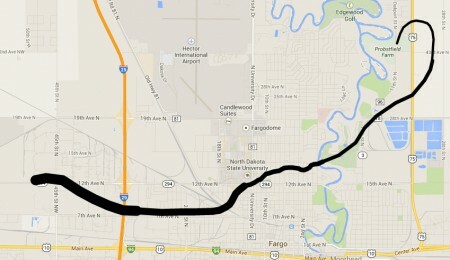 Then, it marched through the residential area along 13th Avenue North, south of El Zagal, before crossing the Red River and into the, at that time, mostly uninhabited areas around the Moorhead Country Club. It had also lost much of its power by the time it reached the Red, and petered out after crossing Highway 75 twice, before fading near Probstfield Farm. 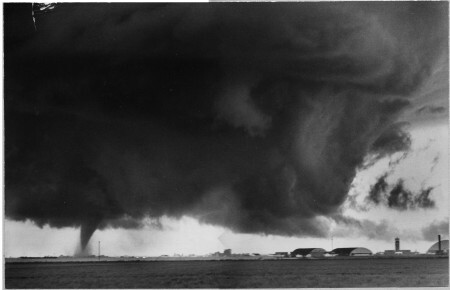 The Fargo Forum won the Pulitzer Prize in 1958 for their quick and thorough coverage of the carnage that followed, and photographer Chet Gebert won several awards for his photos of the tornado and the aftermath. Gebert passed away in December, 2013.